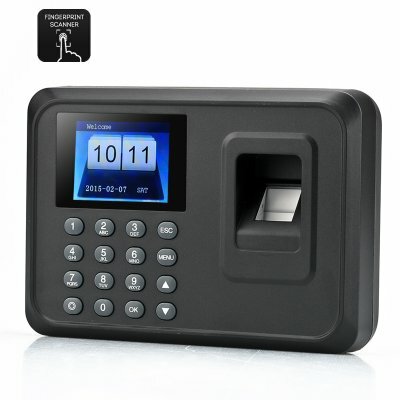 Successfully Added Self-Service Fingerprint Time Attendance - 2.4 Inch TFT Screen, 600 Templates, 100000 Capacity, Fingerprint + Password to your Shopping Cart. This Self-Service Fingerprint Time Attendance features a 2.4 Inch TFT Screen, 600 Templates, 100,000 Capacity as well as Fingerprint and Password identification. The human resource worker’s dream way to keep an eye over the attendance of a work force is with this self-service fingerprint time attendance. Set up outside your office or your factory’s entrance and have the workers use their fingerprints to scan themselves in. Very efficient, quick and also very environmental as it eliminates the need for papers, cards and tags that have been standard for many years. Also nobody can clock in for someone else as everything is done through their own fingerprint, which is completely unique in the world. There is a 2.4 inch TFT screen that confirms and shows data of each fingerprint scan to ensure it has been registered plus there are over 600 templates and a huge capacity of 100000. Not only needing fingerprint scans to mark your attendance, you can also use a password for identification in case your hand is injured. You can download the information as well via the USB host; therefore making transferring the information very convenient. This product is in stock now, we guarantee next working day shipping and offer a 12 months warranty on all our products. Brought to you by the leader in electronic devices as well as wholesale fingerprint devices, Chinavasion.